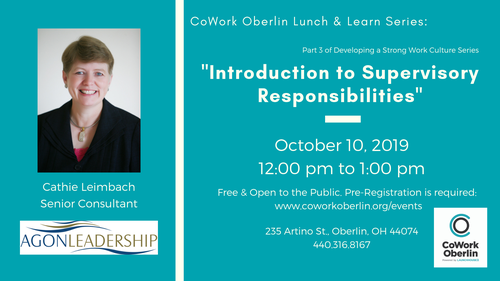 Introduction to Supervisory Responsibilities - Oct 10, 2019 - OBP : CHAMBER : Positively Oberlin! If you haven’t had any training on your role as Supervisor, or despite some training you are still unclear about how to lead others effectively, this session is for you. Your role as a supervisor is to make products or provide services to external customers. Your customers are the staff members who report to you. Your job is to position your staff to be highly effective in making products or providing services to customers. New supervisors often are thrilled that they finally get to run the show. They can require the department to do things the way they want them done rather than having to comply with others’ preferences. And then reality sets in! Since the supervisor’s role is to position others to be highly effective, they have to communicate with their staff in a way that is effective for their staff, even if it isn’t the supervisor’s preference. The supervisor has to train staff members until they are competent to do their tasks independently, even if some employees take five times as long others to develop the skills. The supervisor, who doesn’t like conflict but is frustrated with an employee’s incompetence, has to confront the underperformer in a clear and pleasant manner. Two-thirds of people have left a job to get rid of a boss who was not positioning them for success. Attend this session to learn your role as a supportive boss so the staff on your watch will have high retention, high morale, and high productivity.